Are older people at risk of missing out? James Nazroo and Katey Matthews from the University of Manchester tell us about their report: Digital Engagement in Later Life. The Government's 2014 strategy for digital engagement reported that 69% of those people who lack basic digital skills are aged 55 and over, and that the majority of people who never use the internet are older people from more disadvantaged socio-economic groups. Using data from the English Longitudinal Study of Ageing (ELSA), we set out to better understand the internet behaviours of older people in England, and to identify groups of older people who might be particularly at risk of missing out. There are large differences in internet use on the basis of gender, age, wealth and region of England. We find that the percentage of people using the internet shows a strong decrease with age. Over 90% of men aged 50 to 54 use the internet frequently, compared to just over a third of men aged over 80, and even fewer use the internet among poorer older people. While the use of the internet increased rapidly over the period 2002 to 2012, as you might expect, the rate of increase was much slower for older age groups. For those who were aged 75 and over in 2002 the increase actually changed to a decline during the last few years of this period. The graph shows the change in internet behaviour for over 50s between 2002 and 2012. Each line represents the period 2002-2012 for different age cohorts and that the older the cohort at the start of the period the lower the rate of internet use (the lines are stacked below each other as you move from left (younger ages) to right (older ages)). 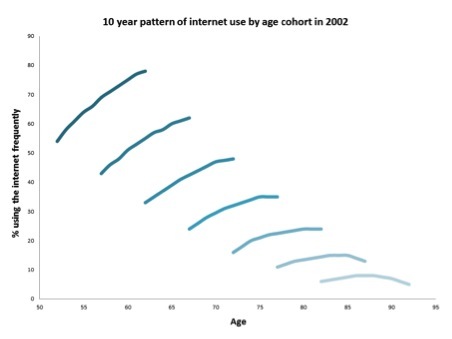 It also shows that although for most age groups there is an increase in internet use over time (the lines go upwards), there is no catch-up across cohorts as the increase (steepness of the line) for the older cohorts is slower than that for the younger cohorts. In fact, for the oldest two cohorts there is a decline over time in internet use. When the older population is stratified by gender and wealth, women and people with lower wealth statuses are consistently less likely to use the internet in all age groups. So, women aged 75 and over from poorer households are the most likely to lack basic digital skills, with only 14% of women aged 80 and over using the internet often, and less than a fifth of people in the poorest wealth category using the internet at age 75 (compared to over half of people in the wealthiest group). The report also shows less internet use among people living in urban areas and areas with higher levels of deprivation. The North East of England has the lowest proportion of people using the internet daily, with the highest rates of daily internet use is present in the East of England, London, the South East and South West of England. People who struggle to physically access services such as shops and healthcare are also less likely to use the internet, highlighting a potential link between disability and ability to get online and that the online provision of services will not necessarily be a substitute for those with poor physical access. Of the older people who do use the internet, the vast majority do so at home. The workplace is the second most common place of internet use until retirement age. The percentage of people using the internet ‘on the move’, which is perhaps increasingly important for digital engagement, decreases rapidly with age. Similarly, the use of laptops and mobile devices for internet access declines sharply with increasing age. Older people who do use the internet frequently most commonly go online for purposes such as email, finding information, streaming live television and radio and shopping. Older women are more likely to use the internet for social networks and gaming than men until age 75, and men are consistently more likely to go online for internet banking than women. However, there is a decline in popularity of these activities as people get older. In accordance with the Government's strategy, support should be provided to organisations and charities working with older people to ensure going online can be a normal part of everyday life. As well as providing internet access which is affordable for all older people, this includes ensuring people continue to use internet skills acquired in the workplace after retirement, and ensuring older people are kept informed of newer technologies and services with the potential to make internet access easier.